Cameras today have lots of innovative features, which allow you to get consistent results in a very wide range of conditions. To achieve this, you need understand what they do and how they work. EOS Training Academy offers a unique programme of courses and events, all of which are exclusive to Canon EOS cameras. This means we can provide you with unrivalled tuition and advice on how to get the best out of your gear. After all, you've invested money into your photography. Getting mixed results can be both disappointing and frustrating. We can make you camera happy. You'll gain confidence with camera handling and a resurgence in pleasure from your photography when you come on a course. There's nowhere else that can deliver such a broad spectrum of courses, with such attention to detail and truly tailored tuition for your camera. Both the programme and the course content are continually revised, so you can be sure that you are learning the latest techniques based on current technology. Our tutors are specialists on the Canon EOS system and all have worked at Canon during their careers. 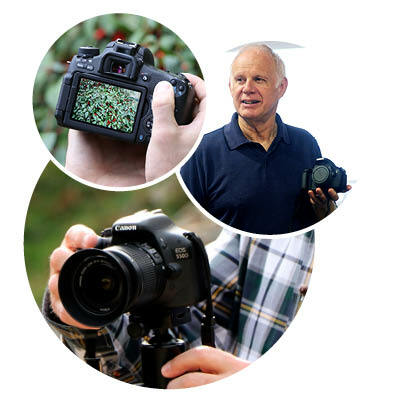 We offer a range of different styles of training, from learning in a practical, hands-on environment in a small group of five or six photographers through to hands-on classroom events with a maximum of either 10 or 12 students, depending on the venue. What's the difference between our course types and why is the course programme split in this way? Everyone learns in different ways. In fact, when you research the topic, there are apparently seven unique learning styles! CClassroom courses are better if you like to listen and learn – you’ll get a handout to work through and take home with you. No interaction is required, though as with all our courses you are free to ask questions throughout (in fact, we welcome it). CPracticals on the other hand are what they say on the tin. We don’t use conventional learning materials, so there are no handouts, no classroom or whiteboard, just a brief chat then out in the field putting what you learn straight into practice. Great for physical learners – if you like to use your hands and learn by touch. A practical course is also the perfect way to follow up after a classroom session. And for 2019, you can also join us for an EExperience day, to put what you've learnt into practice and challenge yourself with a new technique. Each course is now clearly marked as to which type it is. We grade our courses according to current ability level. This is important because, for example, on an Intermediate or Advanced level course, you won't be taught the basics – such as the exposure triangle and how the three dynamic elements of ISO, shutter speed and aperture combine to create your exposure. This means that you may not get what you expect out of your course. Read more about the different Experience levels so you can gauge where you're at with your photography skills and which course would best suit you.